The focus of much of the research in the area of control systems theory during the seventies and eighties addressed the issue of robustness - i.e., designing controllers with the ability to maintain stability and performance in the presence of discrepancies between the plant and model. 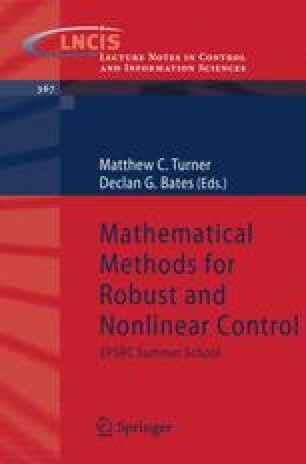 One nonlinear approach to robust controller design which emerged during this period is the Variable Structure Control Systems methodology. Variable Structure Control Systems evolved from the pioneering work in Russia of Emel’yanov and Barbashin in the early 1960’s. The ideas did not appear outside the Soviet Union until the mid 1970’s when a book by Itkis  and a survey paper by Utkin  were published in English. Variable structure systems concepts have subsequently been utilized in the design of robust regulators, model-reference systems, adaptive schemes, tracking systems and state observers. The ideas have successfully been applied to problems as diverse as automatic flight control, control of electrical motors, chemical processes, helicopter stability augmentation, space systems and robotics [12, 23, 28, 30]. This is based in part on C. Edwards, S.K. Spurgeon and C.P. Tan, ‘On the Development and Application of Sliding-mode Observers’, in ‘Variable Structure Systems: Towards the 21st Century’, X.Yu and J.X. Xu, Springer-Verlag, 2002.